The 4th of August was a great occasion, to be able to finally Officially Open our new facilities after many years hard work. It was a culmination of effort by many people of a long period but the standard of finish reflects the ambition of this great club. The Executive Committee decided to name the grounds Weaver’s Fields due to the fact that the Weavers Drain forms the western boundary of the site. 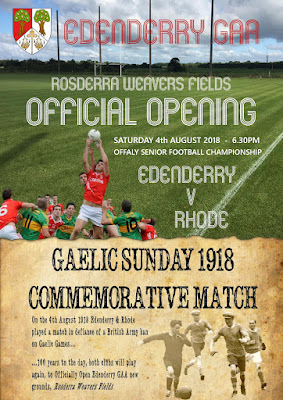 We were delighted that our Neighbours Rosderra were in a position to sponsor the grounds and contribute to the on-going maintenance. Like all major projects this one went down to the wire and the final push on works throughout the month of July was huge. The added concern of the extreme weather and the damage to the pitches added pressure to the situation. The completion of the walkways allowed for the finalisation of our pitch side fencing that really set off the site and began to put some shape on the place. A huge amount of time and effort went into providing dressing rooms and toilet facilities. On a very tight budget we were able to rely on an earlier investment and move our containers from Oaklands. However, they needed lots of TLC and many volunteers were involved in fixing then up. In addition, toilet blocks were sourced and Johnny Hurst, Eoin ‘Bunion’ Dunne & Declan Cummins out their shoulder to the wheel to ensure they were in working order. To Ellie Mooney, Mag Kenny & the Swords family for a huge push to ensure all was clean and acceptable to the public. Despite budget constraints, money was put aside to ensure that we could provide an entrance that the reflected the standard of the development. The fact that it was painted on the morning of the Official Opening demonstrates how tight our timelines were but I think we can all agree it looks great. The other final touches, such as the Donor Wall and Scoreboard add to the quality of the development. Many thanks to Martin Mason for an excellent job on the Donor Wall and huge thanks to Pat McBride of PMB Construction for the significant sponsorship of the new scoreboard and to Noel Crahan for providing the steel frame. Since late Feb. PMB Construction has been working hard battling tough site conditions to get the final groundwork's complete on site. In a short few weeks our new car park will be in full operation and we'll be in a position to place our temporary dressing rooms on site. Much of the work to date has been underground. We've been future proofing the site with extensive drainage and site services. Much of this work is hidden from view but now also complete so the surface dressing can be completed. We will be adding some nice planting in the coming weeks to add a bit of colour to the site. The pitches themselves are in excellent condition. The short animation below highlights the changes on site over the past two months. The first few weeks of September has seen more progress and the fencing etc. has commenced. A Final Grant of Planning Permission is expected later this week so that developments can continue on our new site at Carrick Esker. 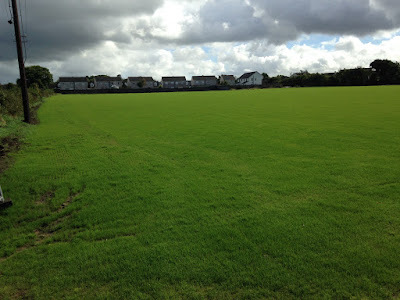 As everyone is well aware our new pitches have really taken shape over the summer months and look great. We are very keen to get our teams onto the pitches and use them in anger. Our groundsmen led by Pat Cullen are doing a remarkable job in keeping the pitches in tip top condition. In April the club received a request for Further Information from Offaly Co. Co. in relation to certain aspects of our planning application. In recent weeks we have been meeting with Officials from Offaly Co. Co. in order to resolve the outstanding issues. We are pleased to announce that we have made a formal response and we are now due a decision by 13th July next. We are hopeful of a positive decision and if successful we aim to immediately set about completing works on site. This will involve the erection of new entrance, boundary fencing, goalposts, ball stops, pitch side fencing, pathways and car parking. The pitches themselves are in excellent condition and are thickening up nicely. Some of our adult teams will be using the pitches for training purposes shortly, however for health and safety reasons our underage teams won't be able to use the pitches until such time as all the works on site are complete. At this stage we are hopeful this would be before the end of the season. In April the club received a request for Further Information from Offaly Co. Co. in relation to certain aspects of our planning application. Unfortunately this introduces a delay to our programme of works but the Club will be working with our design team in the coming weeks to get the additional information together and lodged to the Council. Once we make our response a decision will be due within four weeks. Log onto the Offaly Co. CO. Planning website to inspect the request Offaly C. Co. Planning Search and search Ref. No. 's 17/62 & 17/63. In any event the pitches need a few more weeks of growing in before they will be playable, however they are coming along nicely. They have been fertilized and aerated in recent weeks and with temperatures set to rise next week the growth should follow. This picture from early April 2017 demonstrates progress and the pitches are currently being cut twice a week. After many months of planning, liaison with the membership, wider community & Edenderry Swimming Pool our lead Architect Bernard Voortman lodged our planning application on Friday 17 Feb, following correction of our newspaper advert accompanying the application. Indeed there are two planning applications lodged. One for site A and one for Site B. Both applications are very extensive and contain a huge amount of detail, including drawings for the pavilion renovation, dressing extension on site A and new dressing rooms on site B. We hope to have an initial decision in around 8 weeks c. mid April. 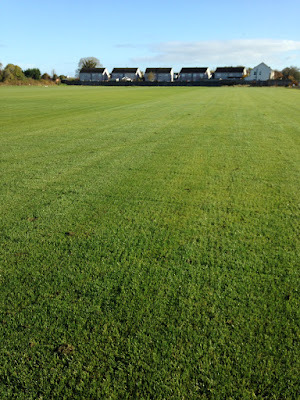 Following a mild Autumn the grass on both pitches has thickened up nicely and now as the growing season ends they will be aerated and re-fertilized ahead of the winter. Looking good for seeing action by late Spring. In 2015 Irish TV visited Edenderry to hear about the purchase of our new grounds and this week they returned for an update. Te pitches have just gone through their first few cuts with our new mower and are looking great. 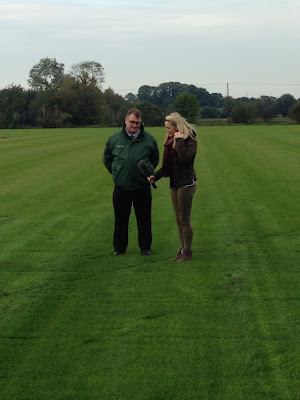 Our sports Turf Consultant was on hand to explain the process to Laura McCormack from Irish TV. With the increased area to be maintained the club has invested in a new tractor and mower. 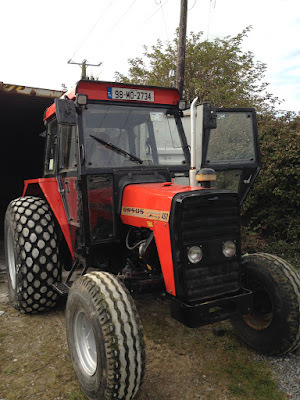 We just recently purchased a 1998 Ursus Mercury 450 Tractor with a Major Rigid Mower. Great additions to our machinery and hopefully will work well. With ground temperatures remaining above normal both pitches are thriving. Pitch No. 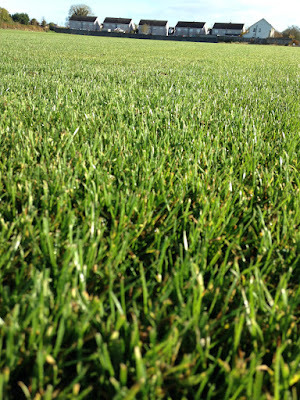 1 received its first cut last week and also fertilized to balance nutrient levels in the soil. Pitch No. 2 is thickening up nicely. Following the success of pitch No. 1 we were very keen to progress Pitch No. 2 and get it seeded before the end of September. Fortunately the improved for a few days and on Saturday 17 September Pitch No. was seeded. The images below were taken on Wed. 28th Sept and progress was good. 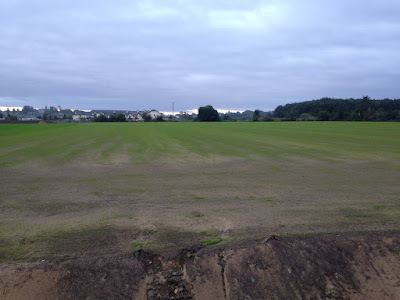 The first 10 days post seeding of Pitch No. 1 provided ideal growing conditions and the pitch thrived. The image below represents the progress made in a number of weeks. 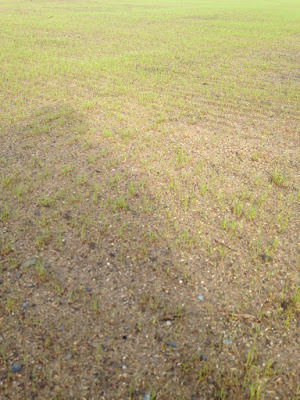 The first green shoots began to appear on Pitch No. this week. The photo below was taken on Sat 10. Sept. Hopefully this week will see an improvement in the weather to allow pitch No. 2 to be seeded. The first week of September witnessed an improvement in the site conditions and the weather. 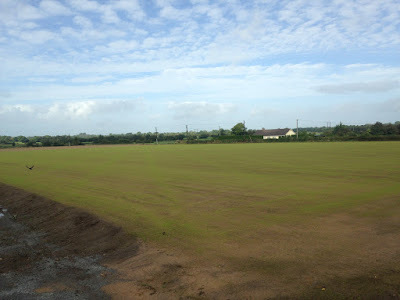 This allowed John Foran and his team to commence the final sanding of pitch No. 1. This involved a layer of 30mm of fine Wexford sand across the entire surface. Following a process of 'tickling' the sand into the top layer of topsoil the pitch was re-levelled again. 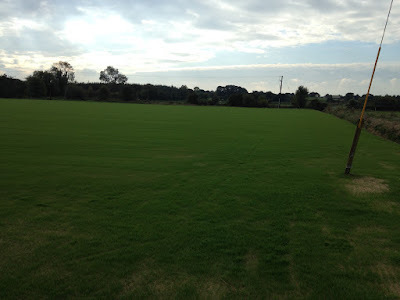 On Friday 02 Sept the pitch was intensively seeded with perennial rye grass seed. Depending on weather conditions it is hoped that green grass will begin shooting up in 10 days or so. However, it will be the end of next Spring before the pitch will be playable. The final drainage works were also completed on Pitch No. 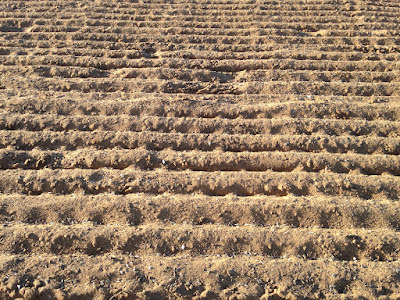 2 and its now ready for the final layer of sand and it is hoped it will be seeded by the middle of next week. 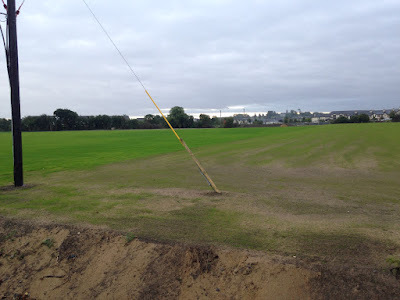 Following heavy rain ESB Networks moved into site to remove the Overhead lines and two poles from the middle of the pitches. The new line which is a combination of new overhead and some underground now skirts the perimeter of the site. Some repair works were required to the pitches following these works and de-stoning and fine levelling continued over the weekend. 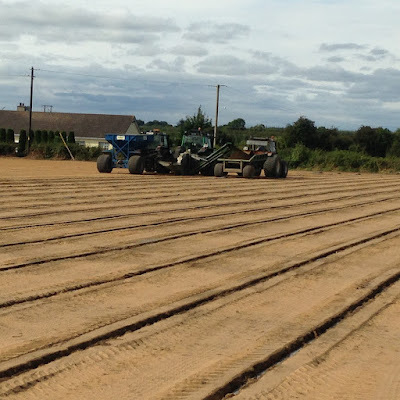 On Monday the 29th of August the first layer of sand was put on pitch No. 1 and the slit drainage was commenced. With this good spell of weather some good progress can be made this week. This week saw the installation of pitch drainage across the two pitches. In addition the ESB commenced works to divert the overhead line that currently traverses the site. These diverson works will be complete on Tuesday and thus clearing the way to allow the final works to the pitches prior to seeding. Unfortunately the weather has taken a turn for the worst and days were lost this week due to inclement weather for the first time since the project started. Hopefully the weather can remain dry next week. 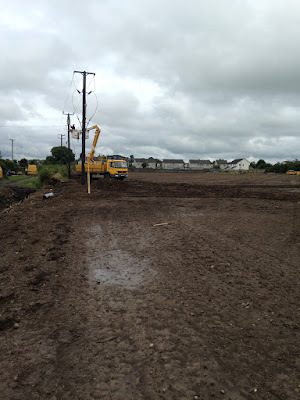 New ESB Poles erected around perimeter of site. Following 3 weeks of intensive works all of the topsoil has been distributed across the site and full site cleared and open. The site has transformed in 3 weeks and with some hidden works, including the main drainage, its been a successful commencement to the project. Over the weekend the pitch was laser levelled and the process of de-stoning has commenced. Next week the ESB will move in to divert the overhead line that traverses the site and this will leave and unimpeded site to progress with. Busy few weeks ahead. Members of the Committee of Edenderry GAA joined John Foran and his team from Emerald Pitch Developments Ltd. on site to inspect progress made in the first week and also to formal mark the appointment of Emerald Pitch Developments Ltd. as main contractor for the project. Check out our on-going photo album that will track progress with the project over the coming weeks. Club Chairman Willie Forde formally appoints John Foran of Emerald Pitch Developments Ltd. as main contractor t construct 2 pitches for Edenderry GAA. 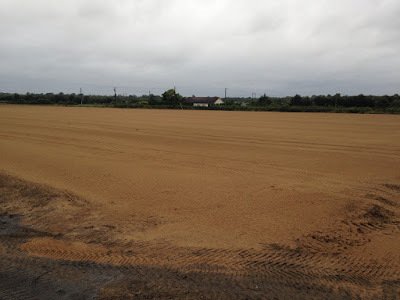 In an effort to move our ambitious plans forward, Edenderry GAA have commenced construction of two sand based grass pitches on our new lands. This is the first step in an ambitious master plan. 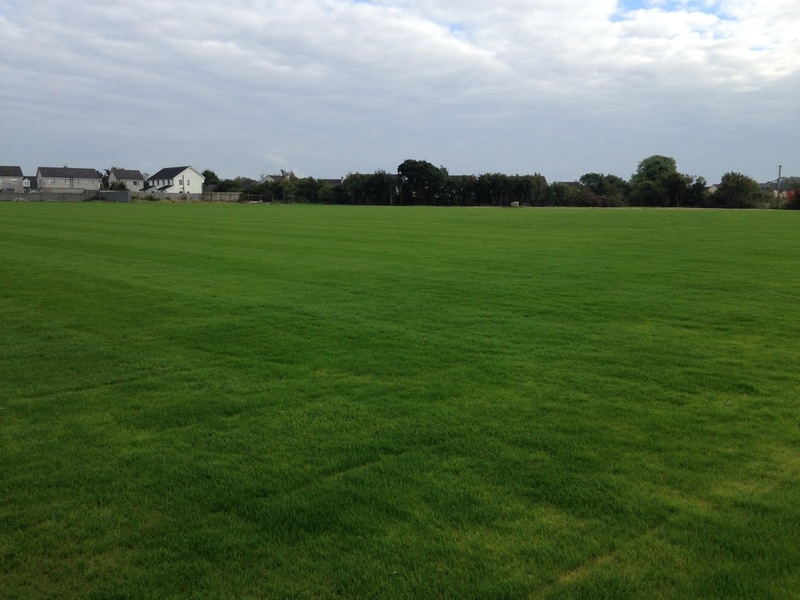 Following a competitive tendering process under the supervision of our Turf Consultant Mr. Richard Hayden of Sportsturf Solutions, local contractor Emerald Pitch Developments was appointed Main Contractor for the project. In an effort to have the pitches ready for 2017 we have moved forward with this element of works by way of a Section 5 Declaration from Offaly Co. Co. The earthworks and grass seeding are deemed exempted development and can commence prior to the lodgement of a planning application for the more permanent structure that will follow in the coming weeks. The works are expected to continue until Sept/Oct and are very dependent on weather. We will provide constant updates here so check back regularly. The number of families and individuals already signed up to the Donor Wall is ahead of schedule at 130. In April will focus on the Business Community and hope to be just as success with this ever supportive group. If we slow to get to you and you are keen to sign up please download the attached Standing Order Form and return to one of our Project Champions. The minimum donation in order to get your name on the wall remains at €250 for individuals and families. As our plans and designs get close to completion our current programme estimates will see us commence construction on the two new pitches Site B this summer. We shall be lodging our planning application in the coming weeks. In return your name/family name will be permanently erected on our planned Donor Wall that will serve as a reminder to future generations of the vision of our current membership. 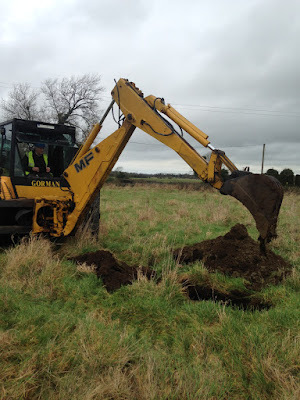 On 21st January Richard Hayden of Sports Turf Solutions attended site to investigate the soil conditions of our lands. This information will allow the club to move forward with the best solution possible. Local Machine Operator Noel Gorman was on hand to assist with the digging of the trial holes. Nearly 100 people attended the public planning workshop in the GAA Clubhouse on Tuesday 6th October 2015. We had a great mix of people from our own active members, coaches & supporters, local residents, school teachers, Edenderry Swimming Pool Reps, Local County Councillors, Eden Tri Club Reps, Skateboard Park Reps and many others. Our Architects Bernard Voortman & Robert Cummins gave a detailed presentation on the proposed masterplan, including the initial site analysis, the results of the online survey and importantly their first draft of how they see the lands being developed. The Architects proposals were very visual in nature and thus easy to understand. They were very well received and instigated much debate and analysis from the floor. Our facilitator for the evening Paul O'Kelly then took over to ensure that all ideas were captured from the debate. Paul had a set of prepared questions that were discussed among small groups and the ideas and opinions were collected for the Architects. It must be highlighted that the initial proposals are open to change and we also wish to highlight the importance of our on-going discussions with Edenderry Swimming Pool to establish if common ground can be found so that the pool can expand at its current location. 1. Review Material from the Workshop and amend the initial design. 2. Meeting with the Swimming Pool Architectural Team to further work up common proposals. 3. Further update proposals and present to interested parties again. All of the workshop material is downloadable from this site. As of July 2015 we are meeting groups within the club, players, coaches, committee members etc. Before concluding our design process we will be hosting an open workshop for all members of the club and wider community to input to the design of our new facilities. In conjunction with our architects Cummins & Voortman, Edenderry GAA extends an open invitation to the community to our club planning workshop. As designs advance for our new facilities we want your views and ideas. Are community groups looking to share facilities?